A picturesque ruined coastal fortress perched dramatically upon a gigantic rocky headland detached from the mainland, Dunnottar Castle is to be found on the north-east of Scotland, about three kilometres (less than two miles) south of the town of Stonehaven, twenty kilometres (less than fifteen miles) from Aberdeen. Looking out to the North Sea, surrounded by sheer cliffs on three sides, it can be accessed only through a narrow isthmus of land with a steep, stone-cut path leading to the top of the rock. 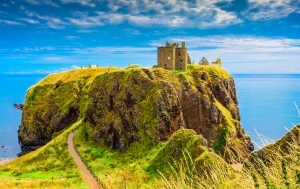 Dunnottar Castle holds one of the most spectacular positions of Scotland’s castles, with its ruins spread over three acres. Its unique strategic position allowed its owners to control the coastal terrace between the North Sea cliffs and the hills of the Mounth, 3.5 kilometres inland, which enabled access to and from the north-east of Scotland. Its dramatic location and picturesque views, as well as the beautiful panoramas surrounding the location, makes it one of the most popular touristic destinations outside Edinburgh. 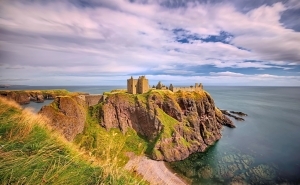 Visitors to the Castle are recommended to walk the short path from the nearby town of Stonehaven, as the route is very beautiful and picturesque. Walk along the cliff-top across from the War Memorial. For those who prefer to arrive by car, there is a small parking area near the Castle itself, after which you will have to walk a short stretch, almost down to the pebbly beach below and then up again, to reach the Castle proper. 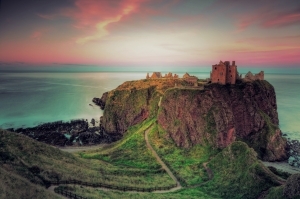 The ruins of Dunnottar Castle are spread over 3.5 acres and surrounded by steep cliffs that drop to the North Sea, over 52 metres below. The headland is joined to the mainland by a narrow strip of land, along which the gatehouse can be reached through a steep path. Visitors with mobility issues should be aware that there are a large number of stairs leading up and down the Castle, which may prove challenging. The strong defensive position of the Castle means that wheelchair access is not possible. The site is in fact accessed via a steep, 800-metre footpath from a car park on the coastal road. The Castle is overlooked by outworks on the ‘Fiddle Head’, which is a promontory on the western side of the headland. The entrance is the main gate which is set in a curtain wall which entirely blocks a cleft in the rocky cliffs. This has a portcullis which has been partly blocked up. The various buildings within the Castle include the 14th century tower house, as well as the 16th century palace. The Palace itself began as a large scale reconstruction and saw the previous medieval fortress converted into a more comfortable home. The 5th Earl of Dunnottar, founder of the Marischal College in Aberdeen, was responsible for this. The palace comprises of a series of ranges around a quadrangle, creating luxurious living quarters on the north-eastern cliffs and having amazing sea-views. The 13th century chapel was restored and incorporated into the quadrangle, and an impressive gatehouse was constructed, which is now known as ‘Benholm’s Lodging’, a five-storey building cut into the rock, which incorporated a prison with apartments above. The lower floors have three tiers of gun ports facing the entrance. The Castle has a secondary access leading up from a rocky cove from which a steep path leads to a postern gate on the cliff top, which in turn offers access to the castle via a water gate. The late 14th century tower has a stone-vaulted basement and originally had three storeys and a garrett above as well. It measured 12 by 11 metres and stood 15 metres high to its gable. The main rooms included a great hall, a private chamber for the lord, and bedrooms upstairs. Waterton’s Lodging, also known as the Priest’s House, is also part of the castle. Built around 1574, this small house includes a hall and kitchen at ground level, with private chambers above. Seven identical lodgings are set into the western end of the quadrangle, above which is a 35-metre gallery, today roofless. The basement of the north range incorporates kitchens and stores, with a dining room and a great chamber above. The east range has a brewhouse, larder and bakery at ground level, with a suite of apartments for the Countess above. The Whig’s Vault, a cellar measuring 16 by 4.5 metres is found beneath the ‘King’s Bedroom’ where King Charles II had stayed, and it is where the Covenanters were held in 1685. The central area contains a circular fish pond and a large cistern, which served as the Castle’s main source of water supply. There is also a small graveyard to the south. Almost all the buildings which make up the castle are roofless and in ruins, with the exception of the restored Drawing Room. Nowadays the castle is almost entirely a ruin, especially due to its destruction during Oliver Cromwell’s bombardment, as well as natural erosion by sea, waves, and winds. Its dramatic panoramic location makes it a favourite with tourists, however arriving there using public transport is a challenge. Driving in a car would be best, since the Castle is barely 20km away from Aberdeen and about 2 miles south of Stonehaven. Summer Season (1st April - 30th Sep) - 9:00 - 18:00 (last entry at 17:30) every day.